No more barking, panting, jumping, or running from window to window during car trips. 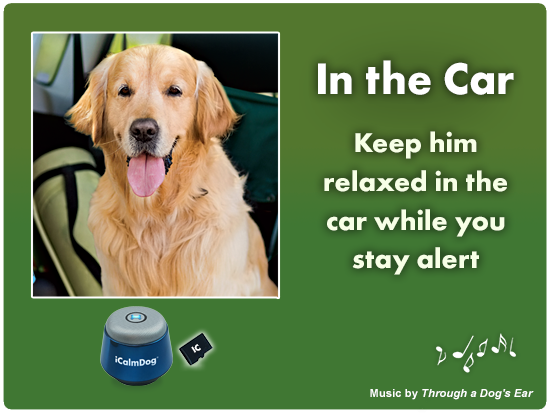 In The Car for iCalmDog is specially designed to help keep you alert while your dog stays relaxed. This Micro sound card has even helped dogs with car nausea and motion sickness. Includes Micro sound card for iCalmDog with 1.5 hours of music, laminated content card, and instruction booklet with behavior tips. 2.0, 2.0a, 2.0b, 3.0, 3.0s, 4.0, 5.0m, 5.0. Many dogs love to go for a ride — but traveling in the car can also be extremely stressful. If your 4-legged friend can’t settle down for the trip, gets the shakes, or pants excessively, now you have a drug-free solution with In The Car for iCalmDog. The breakthrough research behind Through a Dog’s Ear shows that the canine nervous system is extremely sensitive to sound — and that special arrangements of classical music have a profound soothing impact on anxious dogs. Through a Dog’s Ear brings you lively yet relaxing music designed especially for use in the car with In The Car. Whether you’re taking your four-legged friend for a short spin across town or on a long road trip, here is an invaluable music companion to help both you and your dog enjoy the ride. In The Car Micro sound card includes Travel Prep — an additional 20 minutes of music to prepare especially anxious dogs for riding in the car. Also included is a behavior booklet with specific training protocols that address three degrees of auto anxiety.